You always hear people say that effective communication is the key to successful relationships. We couldn’t agree more! But rather than using tips and techniques to improve communication, we find it is more useful to address what gets in the way of our communication and go to work on getting it out of the way instead. When face-to-face with another human being, it’s not often that we are truly there just with that person. What automatically arises for us is a whole lot of our own baggage. If it’s someone we know, then it’s all the experiences we have had with them, how they have made us feel in the past, as well as what they have previously said and done. If it’s someone we don’t know, then it’s our assumptions and judgements about that person, who they remind us of, and where else we associate their tone of voice. Then regardless of our familiarity with the person, there is always at play the anticipation of what they might say, how they might react, and what the far-reaching implications could possibly be. No matter how hard we try, we just can’t escape the running commentary in our minds; It comes with us everywhere we go and is present whomever we are with – it’s simply part of being human. So how can we improve our communication with others? Well, we start by recognising the commentary inside of our heads as merely our own baggage, and then we put it aside. In doing so, we are naturally left with a blank space in which the other person can step into – just as they are. 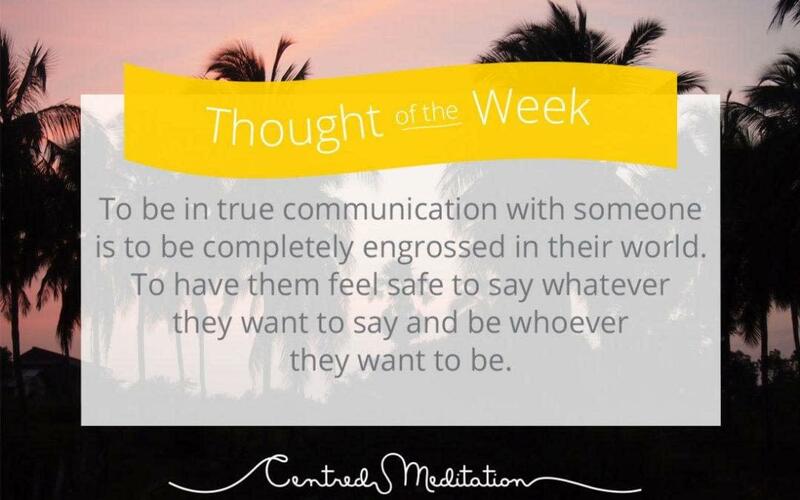 Throughout the conversation, we strive to truly listen to what the person is saying which involves getting into their world, seeing it from their lens and their past experiences. And each time we notice our own judgements, opinions, reactions, and associations, we recognise once more that it’s just our baggage, and then get back into our counterpart’s world once again. You know if you are truly communicating when you both literally feel , as the origin of the word suggests, ‘at one with’ one other. You completely accept the other person for who they are and they completely accept you. You both feel safe to say whatever you want to say, and be whoever you want to be. There’s no friction, no defensiveness, no attack – simply being in each others world. In that presence, anything is possible. It obviously sounds easier said that done, but the key is to be compassionate with yourself, and to keep practicing. It’s a muscle that gets stronger over time and becomes natural and effortless eventually!